Nirali’s roots are in the traditional indian kitchen with its endless variety in cooking and the rigorous demands made of its utensils. This makes nirali tough. At the same time, the indian consumer is embracing modern lifestyles, demanding technology, aesthetics and utility. 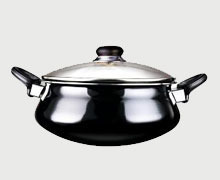 Ever since nirali brought non-stick cookware to india back in 1985, the brand has been at the cutting edge of technology and innovation – offering both style and substance to the discerning, demanding indian homemaker. Way back in 1969, Late Shri Ramji Velji Shah made a Humble Beginning with Trading in products of Hand loom Textiles. His two sons Shri. Ramnik R. Shah & Shri. Hemant R.Shah joined in the business and developed it to a very flourishing one. They, later on diversified into Building Material business, Anchor Electricals and Prince Pipes and Fittings for Entire Tamilnadu, Pondicherry & Andaman & Nicobar Islands with strong Dealer Network of more than 400 Dealers, which continued for more than Four Decades. Of Late, the group continued their business of C & FA and Distribution Network for Building material products of the following companies: Great White Global Pvt Ltd, Prince PVC Pipes & Fittings, Astral CPVC and UPVC pipes and Fittings, Nirali Kitchen Sinks. Etc.. The Group has further diversified into the following FMCG and Home Appliances product also. Nirali Non Stick Cookware,Haldiram Food products, Himalaya Herbals Health Care, Leo Coffee,Anchor Writing Instruments, Anchor Health & Beauty Care products etc..
We are Envisaging to Enter into Agencies Business on Many More Products in Near Future.